Pigs are one of the unclean animals in the past but after the resurrection of Jesus Christ, they were cleansed by God. But what is the difference between "clean" and "unclean" animals? Before the flood, God instructed Noah to keep clean and unclean animals. Perhaps Noah wasn't able to take Dinosaurs. They might too large for the ark. Giraffes and elephants, he did, for they still exist. You shall take with you seven each of every clean animal, a male and his female; two each of animals that are unclean, a male and his female. But how were animals classified clean or unclean? The cow or bull is classified clean, the horse is classified unclean. The goat is classified clean, the pig unclean. Definitely, it is not all about what animals eat. Horses have shoes but they are classified unclean. Goats wear no slippers but they are classified clean. During the time of Moses, God forbid the Israelites from eating unclean animals. For what reason? 11:4 "'There are some that only chew the cud or only have a split hoof, but you must not eat them. The camel, though it chews the cud, does not have a split hoof; it is ceremonially unclean for you. 11:9 "'Of all the creatures living in the water of the seas and the streams, you may eat any that have fins and scales. 11:10 But all creatures in the seas or streams that do not have fins and scales--whether among all the swarming things or among all the other living creatures in the water--you are to detest. 11:20 "'All flying insects that walk on all fours are to be detestable to you. 11:24 "'You will make yourselves unclean by these; whoever touches their carcasses will be unclean till evening. 11:26 "'Every animal that has a split hoof not completely divided or that does not chew the cud is unclean for you; whoever touches the carcass of any of them will be unclean. 11:39 "'If an animal that you are allowed to eat dies, anyone who touches the carcass will be unclean till evening. 11:41 "'Every creature that moves about on the ground is detestable; it is not to be eaten. Obviously, eating pork was forbidden. But eating beef was not. Therefore, Hindus were not right since the beginning. Muslims don't eat pork but could they be right about this? Be aware that Islam was founded by Mohammed 500 years after death of Christ or 500 AD. Now, the God of Moses has cleansed unclean animals on 0 AD. 10:9 About noon the following day as they were on their journey and approaching the city, Peter went up on the roof to pray. 10:10 He became hungry and wanted something to eat, and while the meal was being prepared, he fell into a trance. 10:11 He saw heaven opened and something like a large sheet being let down to earth by its four corners. 10:12 It contained all kinds of four-footed animals, as well as reptiles of the earth and birds of the air. 10:13 Then a voice told him, "Get up, Peter. Kill and eat." 10:14 "Surely not, Lord!" Peter replied. "I have never eaten anything impure or unclean." 10:15 The voice spoke to him a second time, "Do not call anything impure that God has made clean." 10:16 This happened three times, and immediately the sheet was taken back to heaven. See, God cleaned those animals which are classified unclean. They already had been okay for eating. Therefore, Muslims are not right! Islam is mistaken on prohibiting Muslims to eat Pork Roll, Pork Chop, Bacon, Lechon, Chicharon, Crispy Pata, Pork Adobo, Pork Sausages, Ham, Chorizo, etc. Saudi Muslims are forbidden also from eating crabs and calamari. Com'on Muslims make up your mind! So what exactly made animals, birds, reptiles and fish unclean? This is something about spirituality. 8:30 Jesus asked him, "What is your name?" "Legion," he replied, because many demons had gone into him. 8:31 And they begged him repeatedly not to order them to go into the Abyss. Unclean animals could be possessed by evil spirits! Unclean animals are vulnerable to demon-possession! This is the reason why Muslims don't eat pork for their ancestors reincarnated into pigs! Satan himself possessed a serpent in the beginning. He certainly have possessed other unclean animals, birds and fish as well. I doubt with the stingray which killed Australian Crocodile Hunter, Steve Irwin as well the sharks which attack surfers in Australian beaches. They could have been possessed by demons. 3:1 Now the serpent was more crafty than any of the wild animals the LORD God had made. He said to the woman, "Did God really say, 'You must not eat from any tree in the garden'?" 3:3 but God did say, 'You must not eat fruit from the tree that is in the middle of the garden, and you must not touch it, or you will die.'" 3:4 "You will not surely die," the serpent said to the woman. 3:5 "For God knows that when you eat of it your eyes will be opened, and you will be like God, knowing good and evil." Buddhists love dragons, in fact their eyes are like theirs. Satan is referred to as the ancient dragon. Unclean animals were made clean already therefore Satan and his demons could no longer possess them. So how could people worship Satan? What could he possibly possess? Of course, Satan and all his demons could still possess statues and humans which are fond of him. Evil spirits could still possess statues of Ganesha, Durga, Gangá, Virgin Mary, Buddha, Black Nazarene, Sto. Niño, Lady of Fatima, Lady of the Rule, Lady of Peñafrancia, Lady of Lourdes, Lady of Guadalupe, Lady of Mt. Carmel, San Pedro Calungsod, San Lorenzo Ruiz, etc. 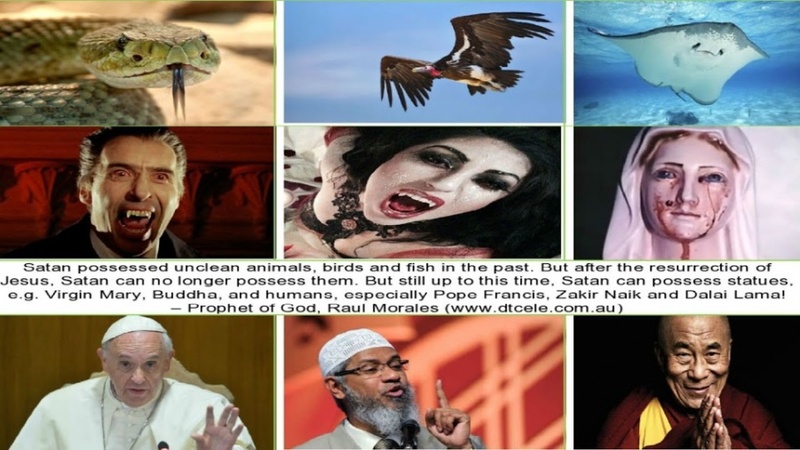 And Satan and his demons could still possess his servants, the false prophets - Pope Francis, Pope Benedict XVI, Catholic Bishops, Priests and Nuns, Zakir Naik, Imams, Clerics, Pastors, Hindu Gurus, Jonathan David, Benny Hinn, Brian Houston, Mike Velarde, Eraño Manalo, Eliseo Soriano, Dalai Lama, Buddhist Monks, Suicide Bombers, Barack Obama and many others. If you have troubles on understanding Scriptures, ask Jesus. He is everywhere. Do not ask Pastors, for they, too, are confused.